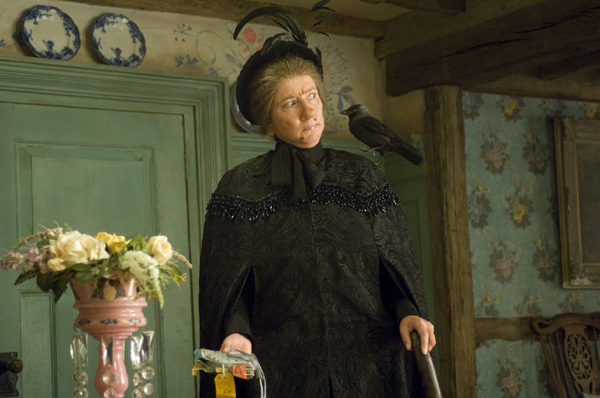 Emma Thompson returns as the quirky and magical nanny in Nanny McPhee Returns, out in theaters August 20th. The Oscar winner chats with us on her inspiration for writing this fun movie sequel, how she juggles being a mom and a Hollywood heavyweight, and who the better nanny is: Nanny McPhee or Mary Poppins. Emma Thompson reprises her role as Nanny McPhee, in which she helps an overworked mom (played by Maggie Gyllenhaal) who is left to tend with the farm and the children while her husband (played by Ralph Fiennes) is away at war. 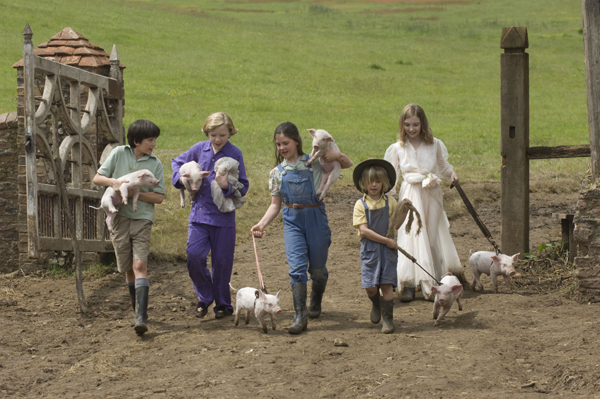 Between the five kids, cows and pigs, there is enough action and humor for the whole family to enjoy. In this interview, which took place via webchat, Thompson was a joy: spunky, funny and full of life. SheKnows: Do you find being so involved in the process of making the film — producing writing [in addition to] acting — much more exhausting than just having an acting role? Or is it just more of a challenge? Emma Thompson: Both, actually. It is more exhausting; there’s no question. There’s always a moment in the shoot when I just can’t do any more, and I have to go. I go back to wherever there’s somewhere to lie down, and I sleep for six hours on the trod or something. It’s very strange. I didn’t get it on this last shoot, though, which was great. I was looking after myself. And that was because my husband really brilliantly said to me, “Look, don’t come home every night. Stay in a hotel near the studio four nights a week, and you’ll survive the shoot.” And that’s what I did. So I have to take my hat off to him. My daughter wasn’t that keen. She didn’t enjoy that very much, but her school holiday started just as she was getting really fed up with me being away four nights a week. And she came and stayed with me in the hotel and did all the running on the set. SheKnows: At this point in your career, do you find more satisfaction in writing, acting or producing? Emma Thompson: The producing credit is a misnomer in the sense that it’s just the second one — you know, what they’re considering to be a franchise. It gives you a little bit of control and ownership over the intellectual property. Anyway, the writing is a wonderful job for a mother because I can write and be a mom. I can do both absolutely full on, because I would never write for more than four hours a day. Four is plenty, plenty… and that means I can do all my mom stuff: school runs, pickups, dinners. So that’s kind of my favorite. But I love acting. I love it. And it’s a great passion, but it’s just slightly more difficult to fit into the process of being a mom. SheKnows: So, a two-part question: What was it like to dress up as Nanny McPhee, from the warts to the tooth? How long does the process take, and what was the final result in your daughter’s opinion? Emma Thompson: It takes about an hour and 15 minutes, which is not very long. To journey into such hideousness, it’s a lot of sticking on and painting. It’s a wig, and then the nose, and the lobes, and the brow, and the wart, and they all get stuck on. And then my makeup artist plunges hairs into the warts and curls them carefully with a very hot curling iron. So there’s this hot thing near my face, and then these hairs start to smolder. It’s quite medieval, the whole process, and indeed, the results are pretty medieval, too. I’m sure a lot of people looked like Nanny McPhee in medieval times. God knows, there are quite a few lying around Great Britain as we speak. You know what we’re like without teeth… What was the other part of the question? SheKnows: What was your daughter’s reaction? Emma Thompson: For the first one, my daughter was only 4, and she just looked at me and went, “Hi, Mom,” — slightly disapprovingly, but kind of, “OK, fair enough.” This time around, she was 9. She was much more “God, you look disgusting” [before she] went off to get a smoothie. When she saw the first [Nanny McPhee] when she was 4, it was very interesting because, right at the end, when Nanny McPhee leaves, she started to cry and couldn’t stop because she thought it was me leaving. I’ll never forget that. SheKnows: Here’s a really tough question. Who is the better nanny: Mary Poppins or Nanny McPhee? Emma Thompson: Well, Mary Poppins is a lot of fun, but isn’t she a little bit narcissistic? And slightly too good looking to have in your home, I would suggest. All that prim, you know… there’s a lot of passion beneath the starchy front, I think. So no, I think if I were to have to choose, I’d definitely go to the McPhee way. 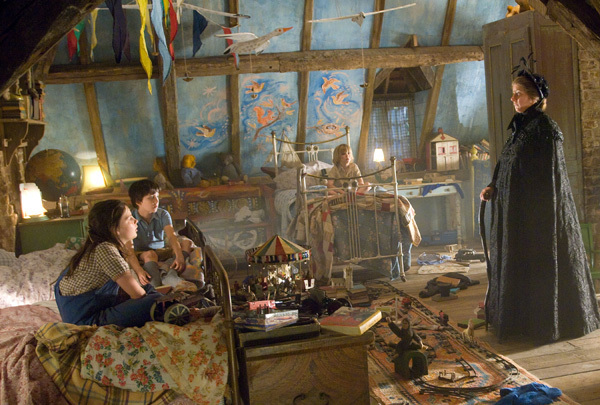 SheKnows: If Nanny McPhee came to visit your house, what would she be helping you with? Emma Thompson: That’s a very, very good question. Myself, I think, is the answer. [She laughs.] I think I would just ask her for an hour of really good therapy. I’d just ask her questions and get her to ask me a few questions and tell me, you know, how to live with myself. Everyone else is fine. It’s me that’s the problem. SheKnows: Of the five lessons that Nanny McPhee teaches in this film, is there one that is closest to your heart? Emma Thompson: To be brave is closest to me. I don’t know whether I’m physically brave, but I’ve always been quite brave. I think it’s good to be brave because then you’re also slightly more able to cope with failure, and failure, of course, is your best friend in every regard. Children are brave, and they’re more likely to take risks and to learn really important lessons. That’s really what I mean by being brave. We take care of our children very carefully, and that’s absolutely right, but certainly in my culture, children are being so stifled by health and safety [concerns]. They’re not climbing trees anymore; they’re not taking physical risks anymore. My daughter lives in Scotland, and she’s already fallen off cliffs and down gullies — so when she picks herself up and says things like, “Well, that’s a lesson learned,” you know that’s the only way she’s not going to go near the cliff edge again because she’s actually fallen off a small one. “Don’t go out with that boy because he will take your heart out of your mouth, fry it up with bacon and eat it” won’t work because no one is going to listen. They don’t, you know that. [But] we’re mommies; we know. So you’ve got to let them get hurt, and you’ve got to let them fail. To do that, you have to let them be brave. SheKnows: Is there anything you do as a mom that you swore you’d never do, but find yourself doing? I try not to shout, ever. I really do try not to shout. And then suddenly I shout, and I feel very bad about that. I never, ever hit my daughter or my son, but people say in Sweden that shouting is just as bad, you know, because you shout and then you just feel like the worst person who ever lived. Yeah, a lot of things — a lot of things, I’m afraid. SheKnows: You’re taking a break from acting. Will you pursue other kinds of projects or just relax with a good book, bon bons and family? Emma Thompson: I have decided to take a sabbatical next year, so I’m going to take my daughter out of school, or prison as I like to call it. I know that’s a controversial remark, but we can talk about that some other time. Anyway, [we’ll] just go traveling and see a bit of the world, but also just sit about staring into space, which I think is very valuable, too. We don’t do enough of that. And acting — I mean, I try and do little bits here and there. And I’m writing a few screenplays at the moment for myself for when I’m able to do a little bit more, because I don’t think I’m going to rely on someone else doing that for me. I thought I’d better get on with it myself. SheKnows: Two more questions. 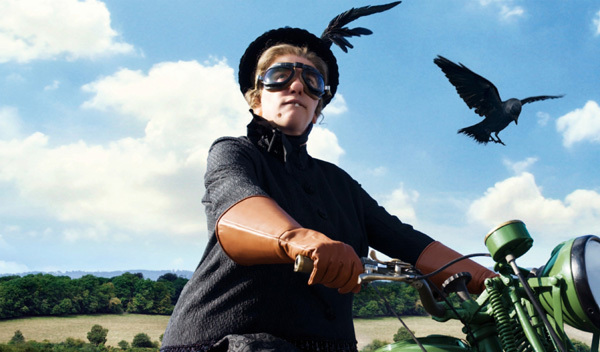 Do you expect that we will see Nanny McPhee return for a third time? Emma Thompson: I hope so, because I think that she’s got more. I think there’s more to be spooled out in that. I’m just trying to work out the third story at the moment, which I want to set in modern-day New York because I think it would be very interesting to see her come to America and deal with a modern family whose great problem — of course, apart from not being able to earn enough money and both parents working and all of that — is that children only communicate through screams. And I think that’s a very interesting phenomenon. SheKnows: And we’ll wrap it up with this question. Has the idea of Nanny McPhee as a musical performed on Broadway ever crossed your mind? Emma Thompson: Yes, because I was going to write the original film as a musical. And then I thought maybe that’s too Mary Poppin-sy, but I did think of it as a musical first. I thought maybe it’s not enough for it just to be a live-action film about nanny who loves children. And then we thought that it was just too much to take on, but I do think, actually, that if you had really wonderful music, it would make a great, lovely musical. Can you imagine seeing that transformation take place over an evening in the flesh? For children. that would be very delightful, and it would be a very interesting conundrum for a makeup designer. How do you do that? Because of course, you couldn’t do the film makeup. You’d have to make it quite another thing. So I think, yes, there’s a possibility that we might try to write the musical for the stage at some point in the future. Check out the Nanny McPhee Returns trailer here!